If your business has suffered from fire, flood, or theft you will need to make a claim on your business insurance. Your insurance company will want to pay you the minimum, and they have a team of loss adjusters to ensure that this happens. 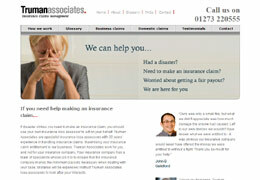 Truman Associates are specialist insurance loss assessors. Insurance loss assessors work on behalf of the claimant, not the insurance company, and it is their job to ensure your business insurance claim is settled fairly. Truman Associates understand that making an insurance claim can be stressful, especially when your business has already suffered loss or damage – you need to get up and running again as soon as possible. They have over 25 years’ experience of helping homes and businesses with insurance claims, and every case is handled competently. Truman Associates work on behalf of both business and private clients to make certain their insurance companies don’t get the better deal. In the case of an insurance claim for burglary or theft from your home or business, there are more factors to take into account than the loss of the money or property stolen. Very often there is damage to property, and the time taken to deal with the theft or burglary can cause interruption to your business or loss of earnings. That’s why you need an insurance loss assessor on your side when making an insurance claim for theft from your business or home, to ensure all the costs involved are taken into account. Over the last decade, there has been a dramatic increase in the number of flood disasters in the UK, and this has seen a corresponding rise inboth home flood insurance claims and business flood insurance claims. As a result, insurance companies are making every attempt to pay out as little as possible on flood insurance claims. Truman Associates can help you to get enough to cover the costs if you or your business has been affected by flooding. You should always make an insurance claim as soon as possible after the incident has occurred. In order to get a fair representation with your insurance company you should also contact an insurance loss assessor such as Truman Associates at the outset. You may believe you will be entitled to a particular amount should a disaster occur in your property, but your insurance company will appoint an insurance loss adjuster to check all the small print on your policy and reduce that amount as much as they can. Truman Associates will do the same for you, making sure you receive fair compensation from your insurers. Truman Associates don’t just help people to get a fair deal on their home insurance claims. They can also help your business when it needs to make a claim. Loss or damage to your business caused by fire, flood or theft can cost a business a great deal in terms of both time and money. Clearing up and repairing any damage is expensive and time-consuming, and your business may even have to relocate. You may also need to pay for data recovery if computers and files have been lost or damaged. And of course, any major incident causes an interruption to normal trading, potentially losing your business a lot of money. As well as getting you the best possible deal on your claim for business interruption insurance, Truman Associates can also give you advice and help to ensure the normal running of your business is delayed for the shortest time possible. When disaster strikes, make sure you are treated fairly by your insurance company. Contact Truman Associates as quickly as possible, and they will work hard on your behalf to get you the best possible payout. They will keep you informed through every step of your insurance claim, and are always happy to answer any questions you may have about the process. They will even explain any unfamiliar terms or insurance company jargon you may come across, so that you have a clear and straightforward idea of what is happening. For further information and advice on what insurance loss assessors can do for you, contact Truman Associates’ Brighton office or visit their website today.